Notes: Tadcaster was founded by the Romans and is mentioned in the 1086 Domesday Book. It is a market town and is the last town on the River Wharfe before it joins the River Ouse about 10 miles downstream. 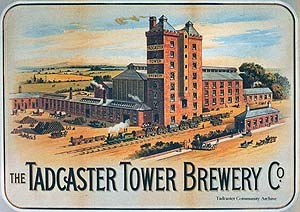 Tadcaster has long been associated with the brewing industry owing to the quality and accessibility of the local water. A number of breweries had private sidings close to the station. Tadcaster station was designed by G T Andrews in Gothic style. It had two facing platforms which were spanned by an overall low-pitched timber roof (trainshed) of 44ft span, with alternate panels of opaque off-white and light purple glass. The station buildings were all of limestone construction and on the up side. They comprised a two-storey, L-shaped stationmaster's house with a pitched Welsh slate roof and bay window on the platform, and a single-storey range: from north to south this contained the booking office and lobby; second and first class waiting rooms and a further waiting room for ladies; a coal and lamps room plus gents’ toilet; and, finally a yard. The stationmaster's office was at the north end of the range adjacent to the booking office and had a bay window which allowed him to look along the platforms in both directions. Care was taken to provide an appealing design both on the exterior and platform elevations, with – in addition to the bays on the station house and the booking office facing the platforms - both paired and triple lancet windows, the latter having trefoil heads. Fawcett (2011) notes that the office accommodation was no more extensive than at the adjacent Thorp Arch station, but because of the decision to provide an overall roof, the office range ‘had difficulty pulling its weight visually in relation to the building as a whole … [nevertheless] the design composed well when seen in perspective from the north’. 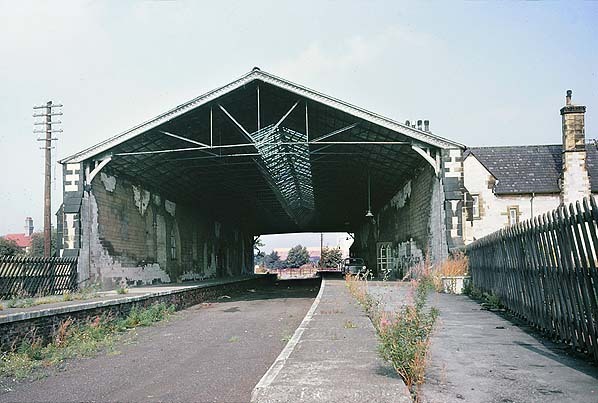 The down platform was backed by the wall to support the trainshed; this was pierced by a series of lancet windows and boasted eleven buttresses on its exterior elevation. This platform had no facilities until the NER installed a waiting room which protruded from the exterior of the wall about midway along the platform. A lattice footbridge at the north end of the station spanned the platforms. In 1850 the station had a staff of 11; by 1900 this had risen to over 25. The stationmaster lived in the station house while the others lived in railway cottages in Leeds Road. The station had two signal boxes; one was at the north end of the up platform alongside the footbridge. This controlled the level crossing to the north of the station and private sidings to the north of the level crossing. Because of its awkward position, the box had a mirror extending over the road which allowed the signalman to see traffic from the east. A second signal box, to the south of the station on the up side, controlled access to the goods yard, the main part of which was on the up side behind the station building. The south box is not shown on the 1909 map below so it is assummed the box closed and was demolished by this date. The yard had a road entrance in Station Road where there was also a goods office. Rail access to the yard was from a short loop from which ten sidings fanned out across the yard which, including the station, covered an area of 8½ acres. The first siding ran parallel to the up line to a cattle dock; the second parallel siding ran though a stone goods shed with a pitched slate roof which was also designed by Andrews. A water tank on a stone tower stood at the south end of the shed. To the east of the shed were four parallel sidings. Another siding ran diagonally across the yard and, parallel to that, two sidings ran over eleven coal drops. The final siding to the east of the coal drops was private and served John Smith's malt house. Two sidings ran behind the down platform to another loading dock with a five-ton capacity crane. There was also a water crane and tank in the yard which was filled from the River Wharfe under an agreement between the NER and the Tower Brewery. Water extraction was limited to 10,000 gallons a day, with no extraction between 1pm Saturday and 6am Monday! On the north side of the level crossing, on the down side, a single private siding served Colley's malt kiln. In 1846 the construction of a line was authorised that was to run from Copmanthorpe (York) to Cross Gates, joining the Church Fenton to Harrogate line between Tadcaster and Stutton. The collapse of railway investment in 1849 led to the abandonment of the project after a viaduct had been constructed over the River Wharfe. If completed the railway would have joined the Church Fenton line just north of Tadcaster station. In 1883 a siding was laid across the viaduct to serve Ingleby's flour mill on the opposite bank of the river. Just north of the junction with this siding a further pair of sidings served the Tower Brewery (the site is now Coors Brewery) which was built in 1882 on land bought from the NER; a third siding came in to the other side of the brewery from the Church Fenton line. In 1911 the station had a catchment area with a population of 4,546. 30,151 tickets were sold that year and this remained fairly consistent until 1922. In 1911 the main freight handled was beer and stout empties, with 55,530 tons being unloaded together with 5,456 tons of grain. 512 wagons of livestock were also loaded at the station. The 1956 Handbook of Stations states that the yard could handle all classes of goods traffic. 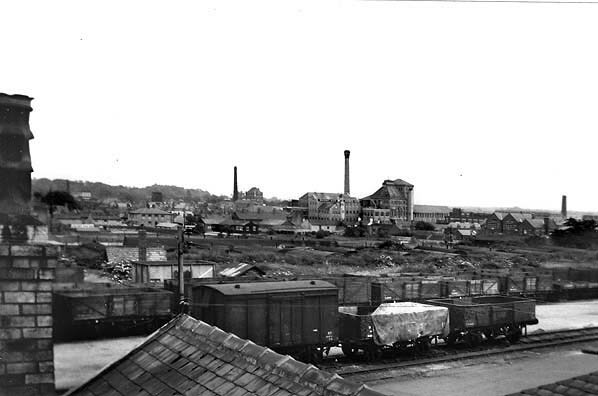 At this time private sidings were still in use serving Colley's Malt Kiln, the Tower Brewery and the Tadcaster Brewery Company’s malt warehouse.Ingleby's flour mill was not listed although the mill owner paid for the siding to remain in place until 1959 in case the mill changed hands at which time the siding could be considered a valuable asset. 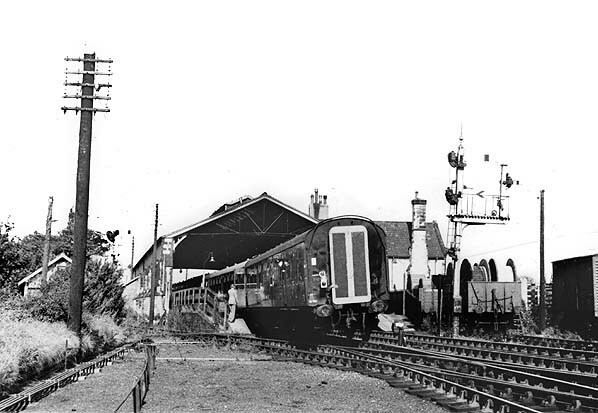 By 1963 the sidings into the Tower Brewery from the Ingleby line had also been lifted. In the 1940s and 1950s special trains brought in pupils who attended Tadcaster Grammar School from Scholes, Collingham and Wetherby. By the mid 1950s the advertised passenger train service was minimal despite the town’s population of about 5,000. The alignment of the railway route through Tadcaster meant that larger urban centres to which it related – York and Leeds – could be reached only by indirect journeys. The abandoned 1840s scheme for direct lines to Copmanthorpe (thence to York) and to Cross Gates (for Leeds) avoiding the circuitous journey via Wetherby would have better served Tadcaster’s needs. 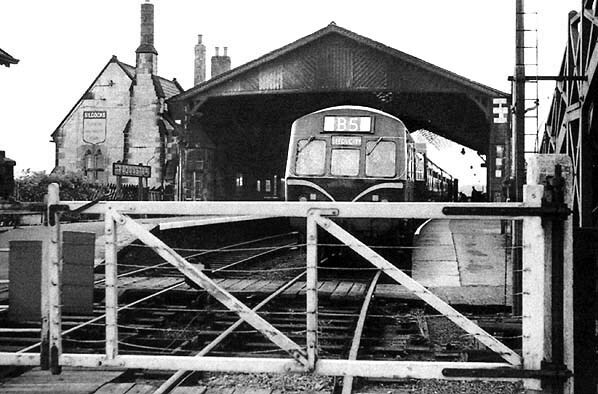 Tadcaster station closed to passengers on 6 January 1964 but remained open for goods traffic until 30 November 1966 when it was the last station on the Church Fenton to Harrogate line to close completely. The station and goods yard site was bought by Tadcaster Rural Council and, in 1968, despite local listing they made an application to the West Riding County Council for permission to develop the site with warehouses, offices, service industries and light industry. The proposal required the consent of the Minister of Housing and Local Government. The Tadcaster Historical Society raised objections, but in 1971 permission was granted and the station was demolished with 2,500 square yards of dressed limestone being salvaged for use in a new housing development in the Hillside area of the town. Click here ro see a map of the proposed Leeds and York extension (via Tadcaster) route by the York & North Midland Railway. You must have Google Earth installed to view this. Notes: Harrogate was known as 'The English Spa' in the Georgian era, after its mineral-rich waters were discovered in the sixteenth century. In the seventeenth and eighteenth centuries the chalybeate waters (containing iron) were a popular health treatment, and the influx of wealthy, but sickly, visitors contributed significantly to the wealth of the town. With the country in the grip of 'railway mania' in the 1840s Harrogate was an obvious target for railway entrepreneurs who were eager to cash in on the town’s popularity, with its wealthy clientele able to pay high fares. In Harrogate local townsfolk and businesses initially opposed the railway, fearing that an influx of people from Leeds and Bradford would lower the tone of the area; but this opposition was overcome. It was going to be a race to see who would be first to reach the town. The Great North of England Railway (GNER) made the first proposal. Having opened their main line between York and Darlington in 1841 they proposed a branch from Pilmoor, 16 miles north of York, to Harrogate via Boroughbridge and Ripon. The York & North Midland Railway (Y&NMR) opened in 1839, connecting York with the Leeds & Selby Railway and, in 1840, with the North Midland Railway at Normanton near Leeds. The line was largely financed by ‘Railway King’ George Hudson who invested a substantial inheritance in the North Midland, becoming a director. He then took an active part in the promotion of the route and commissioned George Stephenson to construct the line. Having completed the York line, George Hudson then turned his attention to Harrogate, proposing a branch to the town from a junction with the Y & NM at Church Fenton, ten miles south of York. The final player was the Leeds & Thirsk Railway (L &TR) who had an ambitious scheme for a new main line linking the industrial regions around Leeds with the north-east. George Hudson had an interest in this scheme as well. George Hudson was clearly keen to increase the size of his empire, and by 1845 he had taken a lease on the GNER, and he immediately withdrew the Pilmoor - Harrogate proposal to leave the way clear for the two other routes. The Y&NMR obtained their Act for the Church Fenton - Harrogate line in 1845, and the eighteen-mile route was staked out in September of that year. 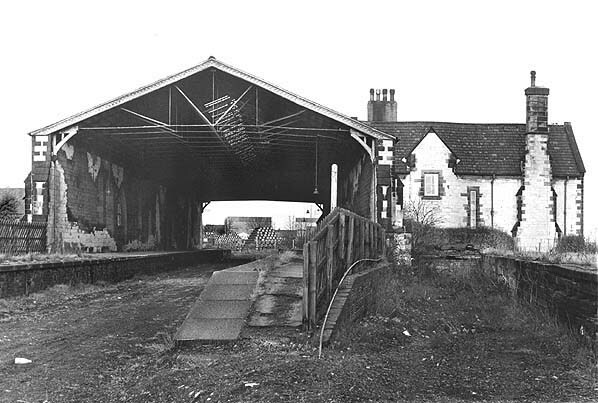 It was opened in two stages, with the first 13-mile section between Church Fenton and a temporary terminus at Spofforth opening on 10 August 1847. There were intermediate stations at Stutton, Tadcaster, Newton Kyme, Thorp Arch and Wetherby, with passengers being conveyed the last five miles into Harrogate by horse-drawn omnibus. The only engineering feature of note was a two-span iron girder bridge over the River Wharfe between Newton Kyme and Thorp Arch. The shorter five-mile section between Spofforth and Harrogate took a further year to complete owing to much more difficult terrain, with a gradient of 1 in 36 taking the line up to the unusually narrow 825yd Prospect Tunnel in which trains were not permitted to pass; then 300yd from the tunnel portal, the line crossed the 624yd, 31-arch, Crimple Viaduct which towered 110ft above the valley floor at its highest point. Beyond the viaduct the line went through the 400yd Brunswick Tunnel before entering the terminus at Harrogate Brunswick. (This was the official name of the station, although in timetables it was shown only as Harrogate). The extension to Harrogate opened, without prior announcement or ceremony, on 20 July 1848. The initial service was five trains per day in each direction with no trains on Sunday. Within two years this had been reduced to three trains each day, probably owing to the opening of the Leeds & Thirsk Railway just five weeks later on 1 September 1848; their station was 1¾ miles to the east at Starbeck. When completed in July 1849, this line provided a more direct route to Leeds without the need to change at Church Fenton. The L&TR had planned to extend their line into Harrogate, but this had to be shelved because of the higher than expected cost of completing their line between Leeds and Starbeck. In an attempt to prevent competitors from encroaching on its territory, a direct Leeds to York railway was promoted by George Hudson through the Y&NMR. The construction of the line was authorised in 1846 and was to run from Copmanthorpe on the outskirts of York to Cross Gates, several miles east of Leeds, joining the Church Fenton to Harrogate line between Tadcaster and Stutton. In 1849 George Hudson was forced to resign as chairman of the York & North Midland Railway following his involvement in dubious business activities. The collapse of railway investment in 1849 resulted in the abandonment of the project, but a ten-arch stone viaduct over the River Wharfe at Tadcaster had already been constructed. The need for the line evaporated with the opening of the Micklethorpe to Church Fenton line in 1869 although the viaduct did eventually see rail traffic in the form of a siding serving a flour mill on the east side of the river. The siding closed in 1955. The viaduct is Grade II listed and is owned by Tadcaster Town Council; it now carries a public footpath and cycleway. The L&TR was renamed the Leeds Northern Railway in 1851, and it was joined by the East and West Yorkshire Junction Railway from York at Knaresborough, east of Harrogate. In 1854 the York & North Midland Railway amalgamated with the Leeds Northern Railway and the York, Newcastle & Berwick Railway to form the North Eastern Railway (NER) which brought control of all the railways in the region under one company. The fledgling NER was quick to improve the railway layout around Harrogate. The NER built a spur from the former L&TR line at Pannal to join the Y & NMR line west of Prospect Tunnel. Just short of Brunswick Tunnel another new line was built to join the line from Starbeck enabling trains to run into a new central station which opened on 1 August 1862. Brunswick station was closed; initially it was retained for goods traffic, but this was short-lived. By 1880 the service between Harrogate and Church Fenton was restored to five trains per day. The North Eastern Railway soon had plans for other new lines in the region. One of the most ambitious was for a direct route between Leeds and Scarborough by-passing York. For much of its route it would utilise existing lines, but it included new construction from Cross Gates to a junction with the Church Fenton - Harrogate line at Wetherby. On 5 May 1866 The York Herald reported that the Leeds - Wetherby Railway Bill had been put before the Select Committee of the House of Commons for a single line to run from the Leeds and Selby branch, near Cross Gates, to the Church Fenton and Harrogate Branch at Wetherby - a length of 10 miles 66 chains. New capital to be raised was £210,000, with borrowing power of £70,000. The work was to be completed in five years, under penalty. Tenders for the project were invited in November 1871 and seven firms responded with bids. The Leeds to Scarborough line was eventually abandoned owing to the economic downturn, although some sections were completed including the Cross Gates - Wetherby line which opened on 1 May 1876 with intermediate stations at Scholes, Thorner, Bardsey and Collingham Bridge. The junction at Wetherby faced Church Fenton so it was not possible to run trains into Harrogate. This was rectified in 1901 when the line was doubled and a new curve facing Harrogate was built at Wetherby. Cross Gates - Harrogate now became an important alternative route to the L&TR which was used increasingly by goods traffic and by the recently introduced Liverpool to Newcastle passenger expresses, which we now able to avoid a reversal at Leeds. As this route by-passed Wetherby station, which was sited to the east of the town, a new Wetherby station opened on 1 July 1902 at the south end of the new triangular junction, with the old station being retained for goods. In 1902 the Great Northern Railway started running express services from Kings Cross to Harrogate via the Church Fenton to Harrogate line, with three daily trains in each direction. These continued after the grouping in 1923 and included the prestigious 'Harrogate Pullman'. Although the Cross Gates to Harrogate line was always considered the major route, the August 1906 timetable shows a good service on both lines with a mixture of stopping and express services. Express trains from London over the Church Fenton - Wetherby line had stopped running by 1947. Wetherby racecourse opened in 1891, and an untimetabed station was opened c1924 to serve it. This was last used on 18 May 1959, but racecourse specials continued to run to Wetherby station from Bradford Exchange on race days until 1963. A new station called Penda's Way, between Scholes and Cross Gates, was opened on 5 June 1939 to serve the growing residential development in that area. In March 1940, additional traffic came to the Church Fenton to Wetherby line when a Royal Ordnance Factory was opened at Thorp Arch just to the north of the station. It was constructed for the Ministry of Supply and built on a 450 acre site. It took 18 months to build and cost £5.9 million. Thorp Arch was considered to be an ideal site, away from the large centres of population, possessing a reliable water supply, good rail links and proximity to the A1 trunk road. Workers were brought in from Leeds, Selby, York and all surrounding areas. 10,000 people, mainly women, were employed there at the height of production, and it is believed to have had 619 buildings. In World War II it produced light and medium gun ammunition, heavy ammunition, mines and trench mortar ammunition for the Army; medium and large bombs for the RAF; and 20mm and other small arms ammunition for all three services. It was linked to the London & North Eastern Railway, which was used in its construction, for supplying raw materials and for transporting away filled munitions. The factory was served by a 6½-mile single-track circular railway with four platforms for munitions workers: these were named River, Ranges, Roman Road and Walton. Special workmen's trains ran from Leeds and Bradford Exchange and from as far afield as Hull and Doncaster on Monday to Saturday calling at the four halts. The last passenger traffic was in 1957 when the five unadvertised trains were withdrawn. ROF Thorpe Arch closed twice: once after World War II and then finally after the Korean War in April 1958. Once production had halted, the site was gradually de-contaminated. In the early 1960s George Moore, a local businessman, bought most of the site and the development of the area as a trading estate began. The estate was later owned by Thorp Arch Limited Partnership, but is now known as Thorp Arch Estate and is owned by the trustees of Hanover Property Unit Trust. It comprises an area of over 100 businesses, including the Thorp Arch Retail Park. 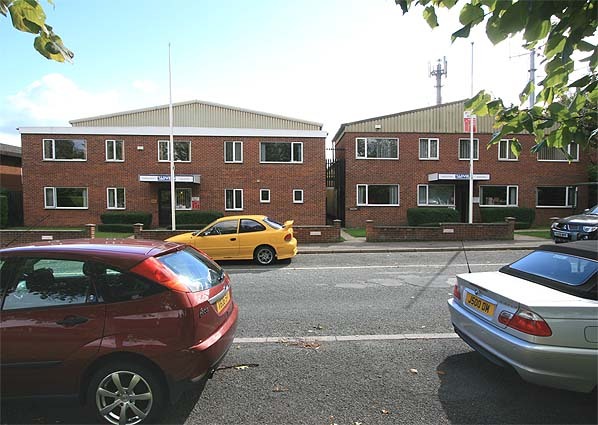 The most notable addition to the estate is the Northern Reading Room, Northern Listening Service and Document Supply Centre of the British Library, occupying what was the locomotive shed and engineering department. Another part is a prison, originally HMP Thorp Arch, now HMP Wealstun. Whereas the route between Cross Gates and Harrogate maintained a reasonably frequent weekday service the train frequency via Tadcaster was drastically reduced after WWII. The winter 1937-8 LNER timetable showed 7 trains from Church Fenton to Leeds via Tadcaster on Monday to Friday in each direction, whilst there were twice as many between Leeds, Wetherby and Harrogate. No trains ran on Sunday. The first British Railways (North Eastern Region) timetable of summer 1948 had only three Monday-Friday trains via Tadcaster, but five on Saturday. In summer 1950 only three trains to Leeds and two to Church Fenton were shown. 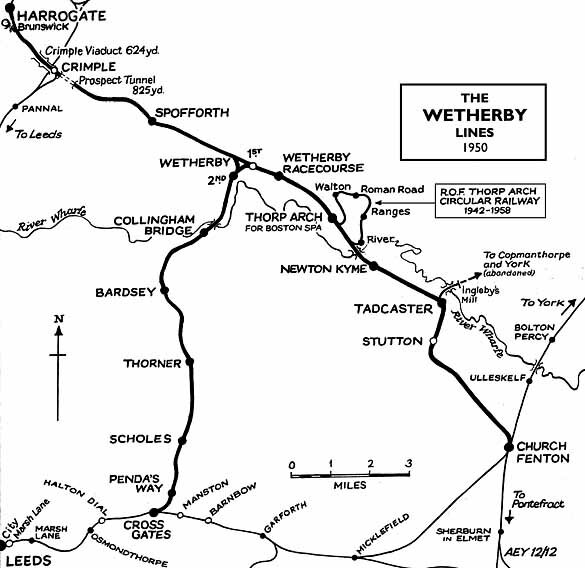 By 1961 there was only one local morning train between Church Fenton and Leeds via Wetherby, and another, also in the morning, from Leeds to Tadcaster, which ran only as far as Thorp Arch on Saturday. No passenger service was shown from Tadcaster to Church Fenton. By 1963 only the 7.44 am departure from Church Fenton to Leeds was shown in the public timetable, the train actually having run from Leeds via Garforth. It is likely that its principal role was to carry parcels. In 1961 there were four trains between Harrogate and Leeds in each direction, with two additional trains between Wetherby and Leeds and one in the opposite direction. Long distance traffic between Leeds and Newcastle had continued to use the line, but this ended with the completion of the quadrupling of the East Coast main line in 1959. The earlier twenty freight trains between Harrogate and Wetherby (in each direction) had fallen to five by 1960.
eventually made passenger numbers unsustainable despite the increase in the number of commuters living in Wetherby. Stations had received minimal investment since Nationalisation, amounting to little more than painting the nameboards in BR(NE) tangerine and installing totem name signs at Wetherby. operated level crossings (requiring 35 staff in total), and the number of steep gradients requiring the use of banking engines, it is of little surprise that it was considered uneconomical. At Wetherby station alone, 14 staff were employed attending to the needs of only 30 passengers per day. The economics of the Wetherby lines were, in fact, worse than the cautionary examples given in Beeching's report. It had a yearly operating cost of £57,000 compared to receipts of £9,000, though some argue that the Wetherby to Leeds route could have been made profitable with some adjustments. Local freight now consisted largely of house coal, the use of which was declining. A notable headline at the time read 'First lamb to the Beeching slaughter', cheerfully further stating 'No regular passengers object at inquiry’, which was the case, but only for the Wetherby - Church Fenton line. It was also inaccurate in that the Newcastle – Washington service, earmarked by Beeching, had closed the previous September! A decision was reached on 24 October 1963, the inquiry having taken just three months, with both lines closing to passengers from 6 January 1964. 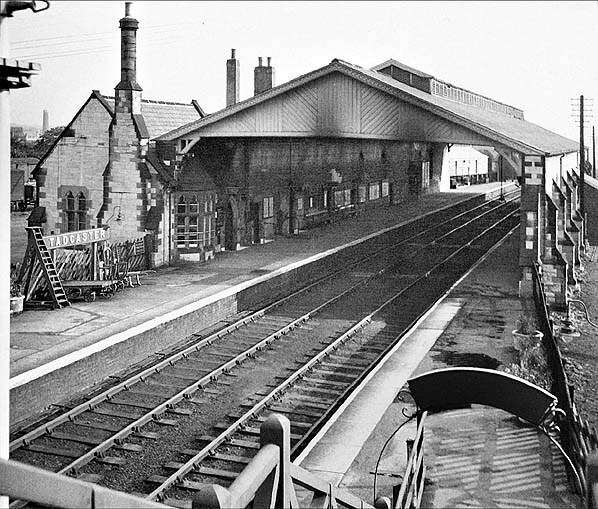 The original Wetherby station remained open for goods traffic until 4 April 1966. The only section of the original route to remain open is the short section of line from the Crimple Viaduct (where the spur from Pannal joined the Church Fenton route to the junction with the line to the former Brunswick terminus. This section is used today by the frequent Leeds – Harrogate – Knaresborough – York services. A new station called Hornbeam Park opened just south of this junction on 24 August 1992. In the late 1960s, it was evident that Wetherby was going to grow. In 1965 it was estimated that by 1981 the town's population would double to 12,000 and this estimate proved quite accurate. There were ambitious plans to relieve growing congestion through the town centre and on the A58 and A661 by converting the disused railways into relief roads. These suggestions never came to fruition. In Railways around Harrogate, Volume 3 (1998) Martin Bairstow presents a compelling case, headed ‘A lost commuter route?’ for the restoration of passenger services between Leeds and Wetherby. He also remarks that the dieselisation of the service in January 1959 could have increased the use of the trains, but without improved frequency of trains that some neighbouring lines enjoyed, there was really no incentive to use them. The track was lifted in 1966. Some parts of the former railway tracks between Wetherby and Leeds have been used for housing development at Bardsey and Collingham Bridge. Sustrans National Cycle Network routes 66 and 67 use some of the remaining trackbed. This line is walkable from Cross Gates to a point south of Collingham where a landowner refuses access to a short section of the line. At Scholes muddy conditions are encountered, but this soon gives way to a grassy embankment with lots of sandstone bridges in situ. The most impressive stretch is just north of Thorner where the line passes through a very deep, narrow cutting with the Seacroft road soaring above on a high brick bridge. At Collingham the road bridge must be used to cross the Wharfe, but from the north bank a footpath follows the embankment, sandwiched between a golf course and the river, into Wetherby. A public footpath and cycleway follows the trackbed from the A1 (M) to Thorp Arch station and from Wetherby to Stofforth - this section of the path is known as Harland Way. Click here to see Church Fenton to Harrogate gradients. Tickets from Michael Stewart. Bradshaw from Nick Catford. Signalling diagrams from John Firth. Route map drawn by Alan Young. Thanks to Martin Bairstow (author/publisher), Peter Tuffrey (author) and the Wetherby Historical Trust who supplied many of the photos used in this feature. Walton Platform on the ROF Thorp Arch Militery Railway. 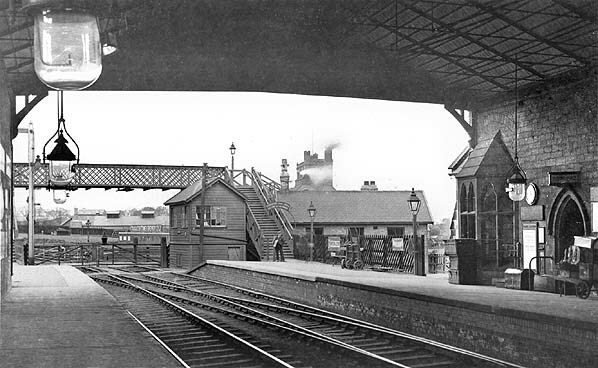 Tadcaster station looking north from the down platform c1910. 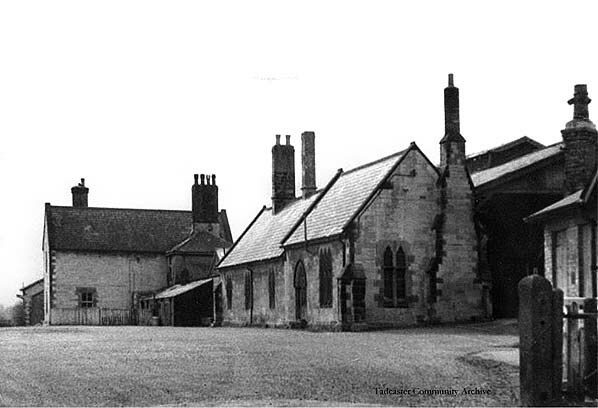 G T Andrew's Gothic architecture is seen on the right with the doorway into the booking office and the bay window in the stationmaster's office which allowed him a good view of the platforms in both directions. The signal box at the end of the platform controlled the crossing and the private sidings on the far side of the crossing. 1893 1:2,500 OS map .Tadcaster had the largest goods yard on the Church Fenton to Harrogate line and was the only station with private sidings. Two sidings are seen on the down side serving a dock at the back of the trainshed. The main yard is on the up side, the first siding serves the cattle dock behind the trainshed with a parallel siding running through the goods shed; the five-ton yard crane is seen at the back of the shed. To the east, three long sidings run up to Station Road with a fourth siding running level with the coal drops which have another two sidings running over them. A short siding serves John Smith's malt house which is seen between the yard and the old quarry. A weighbridge is seen in the top right corner of the yard. On the north side of the level crossing a siding is seen curving away to the east; this crosses the River Wharfe on a viaduct to reach Ingleby's flour mill. Two signal boxes are shown, one just south of the level crossing and the other near the bottom of the map. 1909 1:2,500 OS map shows the yard crane has been moved and is now alongside the dock on the down side. On the up side a long siding has been added, and the siding adjacent to the coal drops has been extended to Station Road. The south signal box is no longedr shown and is assumed closed and demolished by this date. 1962 1:2,500 OS map shows little has changed since 1909 apart from a new building erected between the goods shed and the cattle dock. The buildings to the east of the station are WW2 Nissen huts. Tadcaster station forecourt seen from Station Road c1950. The station offices are sen on the right with the stationmaster's house on the left. The goods shed is seen on the far left beyond the house. 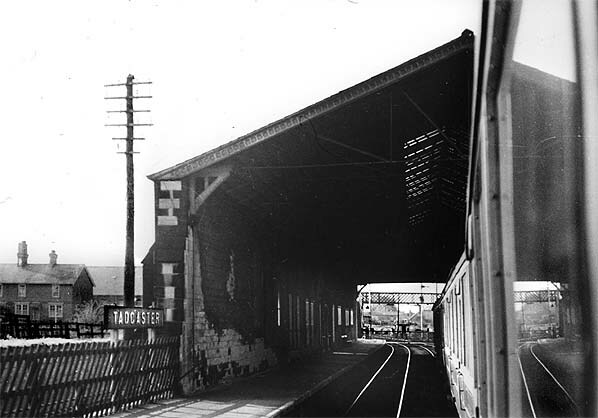 Tadcaster station looking south from the footbridge in the 1950s. 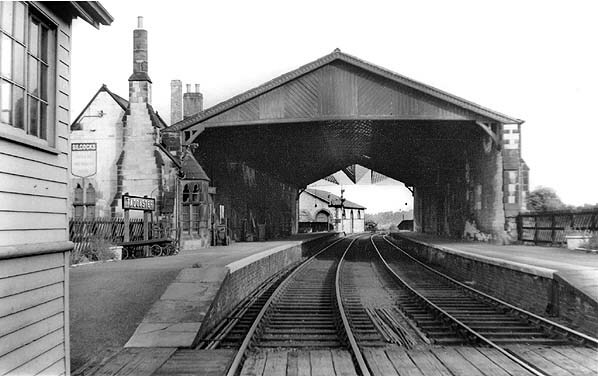 Tadcaster station looking south c1955. The G T Andrews-designed goods shed is seen to the south of the station. The shed appears to be the same size and design as those at Wetherby and Thorp Arch, but without the canopy at one end. 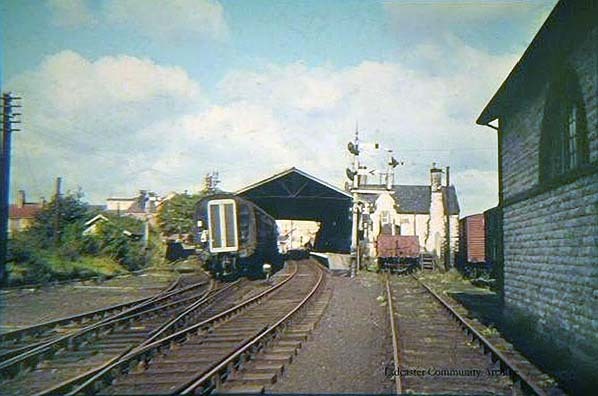 The signal box on the left controlled the crossing and sidings to the north. A second signal box, out of view to the south, controlled the goods yard, with sidings running either side of the trainshed. The Wetherby lines were dieselised in 1959, and a four-car Metro-Cammel DMU is seen in July 1960 working the 7.44 am service from Church Fenton to Leeds. Looking east across the Tadcaster goods yard in the 1960s. Some of the sidings appear to have been lifted. John Smith's brewery is seen in the distance. Looking north-west towards Tadcaster station in 1963. The goods shed is seen on the right. Tthe 7.44am Church Fenton to Leeds City train at Tadcaster station on 29 July 1963. ‘North Eastern Railtour’ on 27 September. Tadcaster station seen from a passing southbound train in September 1963. Tadcaster station, looking north from the up platform in July 1967 shortly after the track was lifted. At this time the station was owned by Tadcaster Rural District Council who, in 1968, made an application to the West Riding County Council for permission to redevelop the site. 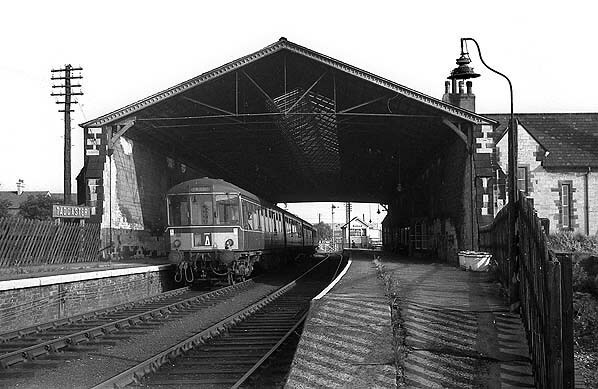 Tadcaster station looking north in January 1971, shortly before it was demolished. The cattle dock is seen on the right. Looking south across Station Road towards the site of Tadcaster station in September 2010.